Wanna Buy Your Own Drone? It’s a sign of the times when new consumer-grade, commercially available remote-controlled drones just show up unsolicited at our offices with an invitation from the manufacturer to take them for a spin. Drones are big news these days, their reputation alternately buoyed and tarnished by their efficacy as machines of warfare and the lack of solid legalities governing their use, and likewise by their limitless potential across a range of commercial applications and their similarly limitless potential for abuse where personal privacy is concerned. But aforementioned concerns notwithstanding, unmanned aerial systems will soon be everywhere and DJI Innovations’ Phantom is the kind of system that will surely be a part of that shift. Designed for neither industry nor government, the Phantom is a pretty serious UAS designed for you and me–the average consumer that simply wants to fly. So you can imagine the unrestrained glee with which we unboxed this unexpected arrival in the afternoon post. DJI is a maker of flight control systems for UAS as well as a handful of complete unmanned aerial vehicles, mostly geared toward aerial photography applications. Most of these platforms are somewhat complex and quite expensive–in other words, best suited for commercial customers or the most serious and well-heeled hobbyists. The Phantom is DJI’s attempt at packaging its technology in a way that is both inexpensive and user-friendly, so much so that anyone can get into unmanned flight. It’s certainly not the only consumer-oriented UAS (see our earlier review of the Parrot AR Drone 2.0) or the least expensive–in fact, it’s a few hundred dollars more than other recreational RC quadcopters. But Phantom lives in a space between the toy quadcopter you might pick up for the kids at Brookstone and the professional-grade hardware that aerial photographers or search and rescue authorities might use. The features that set it apart: serious range and altitude, a durable construction that withstood the serious abuse (both intentional and unintentional) we threw at it, and a satellite-based stabilizing capability that proved quite effective. But that’s not all there is to the Phantom; there were a few aspects of this product that we found clumsy, non-intuitive, and unnecessarily difficult. So if you’re seriously interested in this kind of technology I strongly recommend you read all the way to the end of this post where Phantom gets a chance to redeem itself, because I’m going to lead off with all the things I didn’t like about this otherwise incredibly fun little machine. 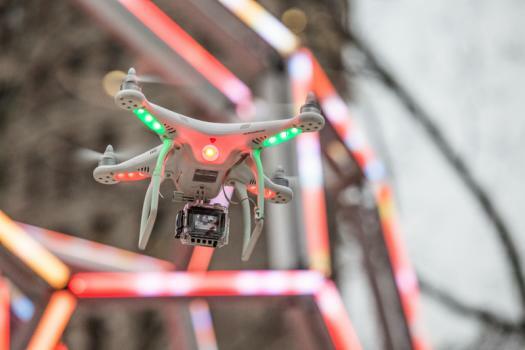 It’s Not Really “Ready To Fly”: Consumer products should be relatively easy to use right out of the box, and indeed DJI describes Phantom as an “all in one solution ready to fly.” But unboxing the drone is not so simple. Attaching the legs with a phillips screwdriver, attaching the propellors with the provided fasteners–this is all stuff that’s expected when you purchase something with “some assembly required.” But actually transitioning from an open box to a vehicle that’s “ready to fly” requires a bit more work. The “Quickstart Manual” is a densely-worded 16 pages long. The battery charging procedure requires its own set of instructions. The calibration process (that is, the process that orients the vehicle’s assorted gyros and accelerometers, as well as syncs it up with various GPS satellites–more on those later) requires some steps that seem nonsensical, like “flip this switch ten times” (ten times!). We don’t mind a learning curve, nor do we mind a little assembly, but “ready to fly” is a stretch. We Don’t Speak Robot: The basic interface between user and machine is a standard RC helicopter-style controller, the dual-joystick kind that has rotor throttle and vehicle rotation pegged to one joystick and lateral movements controlled by the other. But that’s where the simplicity ends. Much of the rest of the machine-human communication is conducted through a blinking LED on the rear of the ‘craft that speaks in something of a colorized morse code that you, the user, must memorize if you don’t want to keep the quickstart manual (16 pages!) next to you at all times. In different flight modes, the blinking colored lights and their many patterns mean different things. Example: When syncing Phantom to GPS satellites, one yellow blink means you have more than six GPS positioning satellites at your disposal. If you have exactly six, you get a yellow blink, followed by red. Less than five? One yellow, three reds. Exactly five? One yellow, a pause, two reds. Switch to a different flight mode, and the language (and color pattern) changes. It’s kind of like Richard Dreyfus communicating with the aliens in Close Encounters of the Third Kind with all those blinking lights and tones. That is to say, it’s kind of annoying. The Controller And Aircraft Don’t Talk To Each Other Enough: Aside from the fact that it’s kind of huge, we don’t take issue with Phantom’s handheld RC controller. If you’ve ever flown a RC helicopter, you’ll take to it immediately. One thing we loved about the latest Parrot AR Drone is that in “Absolute Control” mode the user can always control the drone from his or her point of view–that is, no matter which way the “front” of the drone is facing, it will always travel forward, backward, left, or right respective to the direction the pilot is facing. Phantom’s controller lacks the hardware that makes this kind of intuitive flight possible, and while it does have a couple of helpful flight modes (“Home Lock” and “Course Lock”) that peg the directional orientation of the drone either to it’s point of takeoff or the direction it’s facing at takeoff (respectively), if you are walking around and turning as you fly the drone–and you’ll want to–it’s pretty easy to lose that intuitive link between the direction you are facing and the direction the drone is facing. No Built In Camera, No Drone’s-Eye View: Adding features adds expense, and in the case of aircraft they can also add weight which reduces performance and flight duration. But cameras are so small and cheap these days–the Parrot AR Drone 2.0, the most popular comparable recreational quadcopter, comes with two built-in HD cameras–that we were struck by the fact that the Phantom has none. While it does come with a mount for a GoPro camera (sold separately), that means that it also doesn’t offer a drone’s-eye view, which is one of the more fun aspects of the Parrot and a nice way to pilot the vehicle beyond line of sight (which we aren’t endorsing, since doing so violates FAA rules–but still). Battery Life: I’d preface this complaint by pointing out that there is nothing about Phantom’s battery life that is not absolutely par for course. Phantom runs on a small, dense lithium-polymer brick that takes roughly 45 minutes to an hour to charge fully. 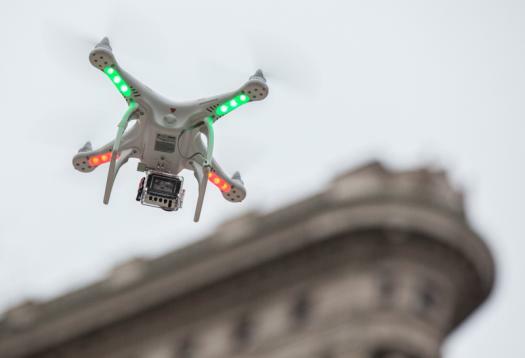 DJI claims a full charge is good for ten to fifteen minutes of flight time. That’s not very long. The good news: we found that we were able to squeeze even a little more flight time than that out of our machine (perhaps because on these flights we were not carrying the added weight of a camera). And fifteen minutes is about average for this kind of product. So this isn’t really a complaint about Phantom, but it is something you should be aware of before you invest in the thing. Somebody please invent a better battery already. This Drone Knows Its Place: Now that the negative stuff is out of the way, let’s plunge into the many things Phantom gets right. First of all, the unique thing about Phantom is its GPS stabilization. That is, when in GPS flight mode Phantom is actually locating itself in space via several GPS satellites, and this allows for some very stable flight characteristics. With GPS enabled, you can be running Phantom at a dead lateral sprint and then let off the directional control. Phantom will actually pitch slightly in the opposite direction of travel (like applying brakes) and then correct itself back to the point in space where you first let off the accelerator (with GPS disabled, Phantom will right itself and cease acceleration when you release the directional control, but its momentum will continue to carry it some distance). Likewise, with GPS enabled Phantom can hover very precisely even in moderate winds, helpful for capturing aerial photography or video (more on that in a moment). A good way to test this is to trigger the failsafe landing mode, which returns Phantom to its point of origin should it lose communication with the controller. Flying it on a soccer pitch adorned with plenty of painted lines for reference, we cut the power to the controller several times. Each time Phantom ceased lateral motion, climbed to sixty feet, slowly returned to the airspace over its point of takeoff, and landed itself on the ground below. Even with a stiff breeze blowing it never missed the mark by more than a couple feet, well within the standard margin of error for GPS technology. It’s GoPro Ready: We love the GoPro. It goes pretty much anywhere, even where the user can’t or won’t, and returns amazing video and still images. Disappointed as we are that there’s no built in camera, the addition of the included GoPro mount is a nice compromise for the user who wants to quickly and relatively cheaply turn Phantom into an aerial photography rig. Pretty cool post During the holiday season of 2013 Brookstone was selling a nice little flying drone with built in camera for less than $400.